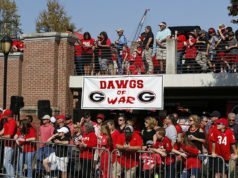 *Quick Strike: The Bulldogs had touchdown drives of 0:15 (one play, 75 yards), 2:46 (eight plays, 86 yards) and 1:04 (six plays, 75 yards) in the first half to take a 21-6 lead. Sophomore QB Jake Fromm directed all three drives and finished the half 14-for-19 for 207 yards and two touchdowns. 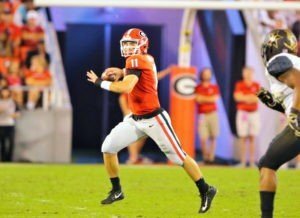 He completed passes to seven different Bulldogs. The Commodores completed the half with a time of possession of 19:53 to Georgia’s 10:07. 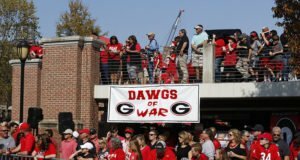 Vanderbilt ran 36 for 230 yards while Georgia had 26 plays for 263 yards. *Trailing…Briefly: Vanderbilt kicked a 25-yard field goal at the 10:30 mark in the opening period to take a 3-0 lead on a five-play, 50-yard scoring drive. This marked the first time the Bulldogs had trailed all year. 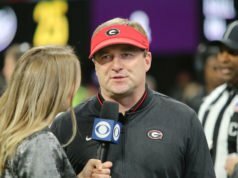 Following a touchback on the ensuing kickoff, Frommconnected with senior WR Terry Godwin for a 75-yard touchdown on the first play of the drive, which marked the longest passing play of the 2018 season thus far. This was a career-long catch for Godwin and the longest for the Bulldogs since Fromm connected with Mecole Hardman for an 80-yard score in the 2018 CFP National Championship versus Alabama. *Red Zone Stop Turns Into Points: While the Commodores made the best out of their first trip to the Red Zone, Georgia’s defense held Vanderbilt scoreless on their second trip to the Red Zone. 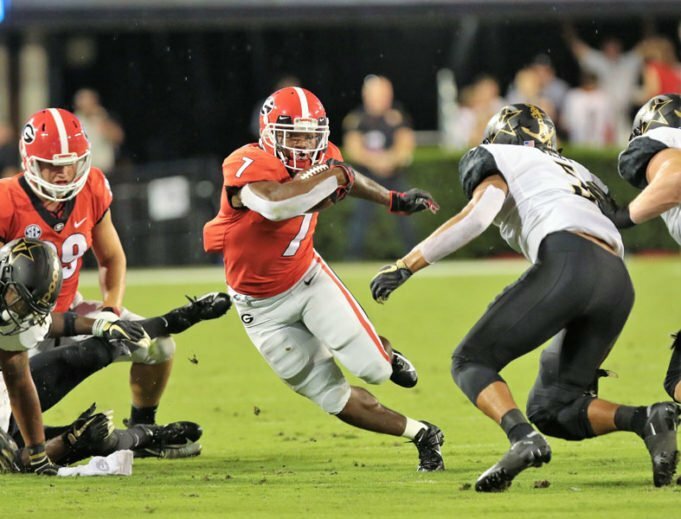 The Bulldogs stalled a drive that started on Vanderbilt’s 5-yard line by stopping the Commodores on the Georgia 14-yard line during a 4th-and-1 situation. This was the Bulldogs’ third Red Zone stop of the year. Following that stop, Georgia marched 86 yards down the field and capped the eight-play drive with a 24-yard touchdown run from junior TB Elijah Holyfield. Sophomore Richard LeConte led the Bulldogs in the first half with six tackles and a forced fumble while senior ILB Natrez Patrick had four stops, including a tackle for loss..
*Blankenship Ties PAT Record: Junior PK Rodrigo Blankenship connected on three extra points to make him 30-for-30 on the year and to give him 119 straight, which tied Blair Walsh (2008-10) for the school record. 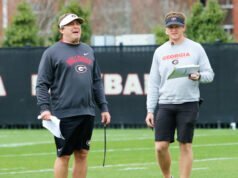 Blankenship also had touchbacks on three three kickoffs, giving him 40 on the year and 128 in his career. *Penalties: The teams combined for 11 penalties that went for 103 yards in the first half. The Commodores had six for 54 while Georgia had five for 49. *Injuries: Redshirt sophomore LG Solomon Kindley went down in the first quarter with a right knee injury. True freshman Trey Hill came in for Kindley. This is the third starting offensive lineman for the Bulldogs that has gone down at some point this year (sophomore LT Andrew Thomas, redshirt sophomore RG Ben Cleveland). Thomas is back in the lineup while Cleveland is still out. *Captains:Today’s captains are juniors Elijah Holyfieldand David Marshalland sophomore Andrew Thomas.